Orc weapons are typically very simple in form, although that simplicity does not make them less effective. If anything, weapons like this Orc LARP Axe are just as effective looking as their more ornate cousins, if not more-so thanks to a rough, deadly edge. After all, with its jagged blade, this weapon looks very much like it would cause more harm than a more typical, smooth edge. As is typical of orcish weapons, this one is all about efficiency first. The axes haft features a simulated wood grain and a rough appearance, making it look plain and simple. The axe-head is supported by small connectors, and it features a broad blade with small nicks and cracks in the blade, making it look either well-used or roughly made. Either way, it remains a dangerous looking weapon that would fit well into the hands of either a classic orc or any other barbarian warrior. That dangerous look, though, is tempered with safe construction, which makes this weapon ideal for use in any LARP battle. It is constructed from an extremely durable foam that does not shred, which has been sealed within a strong coating of latex. As safety is always a concern in LARP, this weapon also features a round, flexible fiberglass core that bends and flexes. The core also features a durable Kevlar cap for added protection, both against the core and for when the weapon is used to stab. Please note that the wood-toned handle can vary slightly in color and shade. Unfortunately we are unable to pick specific color combinations for orders. 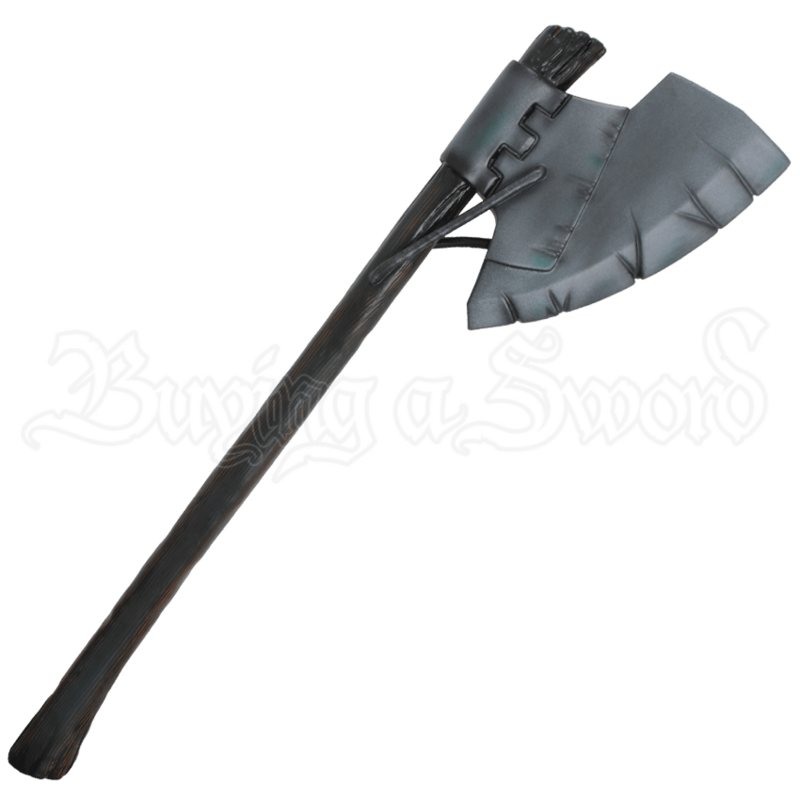 The Orc LARP Axe has an overall length of approximately 36 inches. Please be aware that this measurement can vary slightly, as it is a hand-made item.